If you are on the low Fodmap diet for irritable bowel syndrome, you are probably completely confused when you go shopping, especially if the food comes in a box or packet with all sorts of ingredients, many of which don’t sound like food. If that is the case, the best thing to do is to put it back on the shelf because processed foods contain additives that are gut irritants and so can hurt us. But, if you need something like crackers or cottage cheese or yogurt, then you will need to be able to read the ingredient labels and choose a safe option. In this video, I help you to identify some of the most common culprits to avoid. This information is also included in my book, The Low Fodmap 6-Week Plan and Cookbook, which is available in all good bookstores and online. Today I want to give you a little bit of guidance when you go shopping, and you pick up a product, and you look at the ingredients list, and you don’t really know what you’re looking at. Here are a few of the things that you have to look out for. Let’s start with sweeteners. Your plain table sugar, we know is fine for us, obviously not in high amounts. But look out for high fructose corn syrup, that’s not okay, agave syrup, yacon syrup, anything with the word fructose in it is not going to be all right, as well as honey, as we know. We can’t have any of those sweeteners. Also the artificial sweeteners are not going to be kind to our tummies. And most of those will end with OL. So look out for words ending with OL in the ingredients list. A couple of things that are in a lot of processed foods today are inulin and chicory root. Both of those are high FODMAP, and you’ll find them in things like yogurt, breads, and crackers. They seem to be in a lot of things, and they’re often called– dietary fiber as well. Of course, you’re going to be looking out for garlic and onions on the list, but they can be hidden in sneaky little ways. They could be in the word “spices”, although I have heard that in the US, they’re not actually allowed to hide garlic and onions in spices. But in the rest of the world, spices could include garlic and onions. Definitely “natural flavors” is troublesome. You see that a lot in ingredients. And that’s bound to have some form of garlic or onions as a powder or a salt, or something like that. So be on the lookout for them. Another place where you could end up with some garlic and onions, that you might not think about, are spice blends. So use just the spices separate, like cardamom or coriander – that won’t have it in it. But if you have for example the Chinese five-spice blend or something like that, that could have garlic and onions. So, even with those, check the ingredients. Something else to look out for are dried fruits, which you’ll find in a lot of cereals and bars, like protein bars. You do have to watch out for that. I mean, we already know with cereals that they’re normally very high in sugar and so are not going to serve us well, but they also often contain dried fruit, and that’s going to be a no-go area for us. And the last thing I want to mention is when you’re looking at gluten-free processed goods, there are nearly always gums in them. And they put the gums in because they take the place of gluten, which holds the product together. And there’s a whole raft of different gums, so just look for the word “gum”. They are not a FODMAP issue, in fact, they haven’t been tested, but we think they’re low FODMAP. But they do ferment in the body, and so upset some people. So, I would stay away from them completely, which really means staying away from most processed, gluten-free foods. And anyway, we don’t like processed foods. We want things to be as fresh as possible so that our gut doesn’t get irritated. Something else to think about when you look at an ingredients list is, they are listed in order of amounts. So the first thing listed has the most of it. And something right at the end of the list is only going to be a small amount. Therefore, if you did have something like an onion flavor right near the end, that possibly won’t affect you. You won’t be getting enough for it to be a problem, since we mal-absorb FODMAPS and we’re not intolerant – we can absorb some of them. So just check out the order. You’ll be surprised at how many foods actually have sugar very high up on the list. And that should set off alarm bells for you. I wanted to mention that Carageenan is an ingredient used as a thickener and is used in many organic foods too. It is a highly processed additive derived from red seaweed. I had been really watching all my ingredients and was having horrible gut and intestinal issues. I finally realized that Carageenan was the culprit! After reading up on it on the internet, it is a known gut irritant . Even a bite of a dessert or yogurt containing Carageenan and I am in distress! Yes, it is an issue for some people. 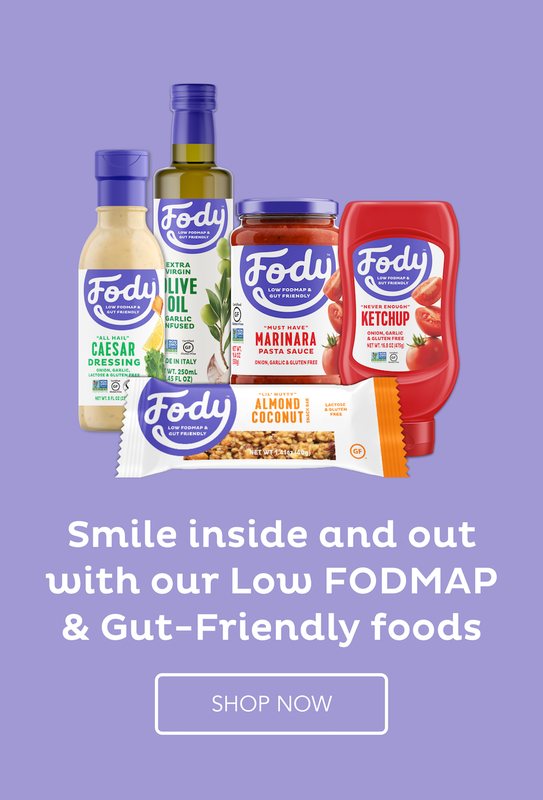 A bit like the numerous gums they use in processed food – they are low Fodmap but still can be gut irritants in some. Can we have dried Cranberries ? Or no dried fruits at all. Yes, we can have 1 tbsp dried cranberries.